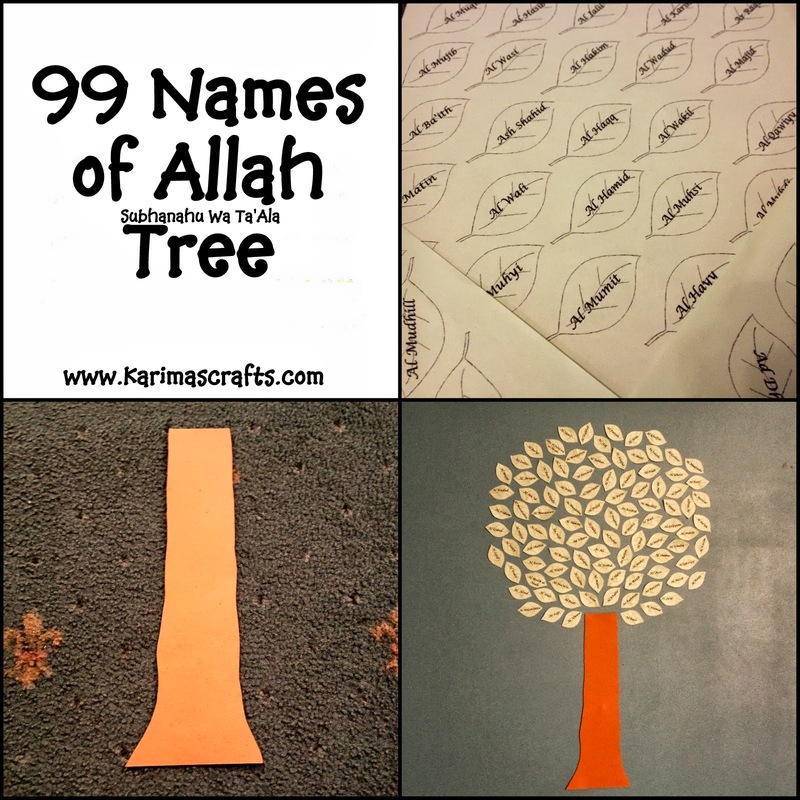 This is a great craft for the children to do and can help them with learning and reciting the 99 names. This particular Craft had a lot of computer designing to it - but you can alternatively do all of this by hand too. If you do want to do it similar to what we did I have put some links to PDF Files that I made to design this Tree that you can download for free - you will find these links at the bottom of the post. This is displayed on my daughters' bedroom wall for them to learn as they wish. I now have the names available to download translated into Arabic! A lovely sister volunteered to do this for me and now I can give you this option. Large piece of paper - (could use wallpaper) if you are affixing the leaves onto a backing sheet. Paper/Card - Brown for the trunk or again you could colour in this yourself. Blu-tac - to fix the leaves and trunk onto the wall or the backing paper onto the wall. Glue - if you are attaching the pieces to the backing paper. Either download the printed leaves/printed leaves with names or draw and write out each leaf yourself. I just used an online site to copy the 99 names from. We used English but a lovely sister volunteered to translate these into Arabic and place them into my design, so I now have this link for you. She wishes to remain anonymous - but I am so thankful to her. If you want to put the tree onto a backing sheet start organising where you are going to put each leaf so that it makes the shape of a tree. Once you have a rough idea you can start gluing the leaves onto the sheet. If you are applying the leaves directly to the wall as we did then you need to attach a small piece of blu-tac to the back of each one and start sticking them onto the wall until you get the shape you want. (you may need to move them a couple of times until you are happy with the shape of the tree! Once you have the leaves in place you can then move onto the trunk of the tree. Try to make the trunk size in comparison to the size of the top of the tree so it doesn't look too out proportion. We used brown card for the trunk but you could just use plain paper or card and colour the trunk in yourself. Then affix it to the backing paper or the wall. I used Blu-tac but there are many other things you could use that may be easier for sticking paper on walls. If using a backing sheet then maybe prit-stik would work. I worked from the bottom of the tree to make a semi circle using half of the names and then used the rest to finish the circle - there may be better methods than that! As mentioned I used the printed system but handwriting them would be just as good and more unique! Below are snippets of what the PDF Files Will Look Like. I've read about a Good Deeds tree for Ramadan but this is a nice change! I love this idea Karima. I keep all of them ready for next year, as Mister Pop is a bit too young for this. Thanks, very beautiful, I work at school in Bosnia and will use in my classroom. May Allah Reward you. Salam alaikuim sis very beautiful idea below is a link to the names of Allah subhawata ala with an authentic chain for each Name of Allah. Great idea sis. I'm using this for my children's room inshallah.